As does The New Yorker! Sunnyside Records. Otherwise, if you ask nice, you can buy a fresh copy at the release show! A combination of indelible pop tunes and his own compositions, Songs We Like a Lot is propelled throughout by Hollenbeck’s creative arrangements for the Frankfurt Radio Bigband. These arrangements are heard to spellbinding effect in the album’s opener, a moving reimagining of “How Can I Keep From Singing.” The song is most strongly associated with Pete Seeger, and co-written by him; this rendition is intended as a tribute to the recently departed folksinger, who passed away only last year. A slowly swelling opening fanfare gives way to a steady pulse, which in turn builds, via a lovely tenor solo by Steffen Weber, to a rich crescendo, the horns framing delicious harmonies from McGarry and Bleckmann. Among the Hollenbeck originals is “The Snow Is Deep on the Ground,” a delicate composition that originally appeared on the Claudia Quintet’s What is the Beautiful? Bleckmann sings words by poet Kenneth Patchen in both versions; here, rather than the skeletal framework of the quintet, his voice is embraced by a full brass and woodwind blanket of sound. Pianist Uri Caine and vocalist Kate McGarry are two new additions to this lovely, enlarged version. Another poet’s words figure in the Hollenbeck original “Constant Conversation” — those of 13th-century poet and mystic Rūmī. “Constant Conversation” uses Middle Eastern musical motifs to undergird McGarry’s spoken-word vocal. A riff and a drone and an unerring sense of melody allows Hollenbeck to create an atmosphere that feels at once deeply personal and innately global. This is sole tune on which keyboardist Gary Versace appears on this record, though his piano was heard throughout Songs I Like a Lot. 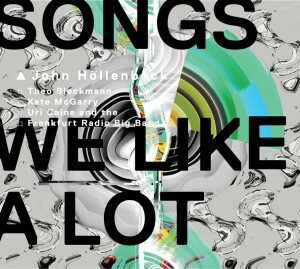 What John Kelman in his AllAboutJazz.com review of Songs I Like a Lot called “Hollenbeck’s skill at taking small but defining motifs from an original song and use them as starting points for broader orchestrations” is on full display in his reworkings of the pop chestnuts “Close to You” and “Up, Up and Away.” The latter reaches heights never dreamed of by original performers The Fifth Dimension and composer Jimmy Webb. A pulsating fever-dream of horns in flight, “Up, Up and Away” provides the album’s closing burst of color and beauty. In reviewing Songs I Like a Lot, David Hadju wrote in The New Republic that “you can hear, in [Hollenbeck’s] work, the collapse of cultural borders, the shuffling of traditions and influences, the old and the new and the earthy and the urban and the proper and the wiseass, swirling in unstable but unstoppable motion. Hollenbeck is a musician for our time.” This is only more true now. I hope to see you on hump day so we can celebrate together!